Godchick Designs: Happy Mother's Day! I love stamping & scrapbooking! Crafting is my thing...I inherited it from my mother. Valentine's Day 2006 I married my prince charming. I love him and I love being married to him! We have a beautiful little girl that we are enamored with! Add to that two fiesty, crazy & slightly neurotic dogs that we love to pieces. Life is awesome...I have great blessings that God has showered upon me! This was a card I made a couple of to have on hand. My first time playing with this set by My Favorite Things. It's such a cute set! And so neat for Mother's Day! I apologize for the dark photo, I was using my hubby's camera and the macro setting didn't work quite like the one on my camera does. I haven't gotten around to taking a better picture yet. The card base is Elegant Eggplant, layered with Taken with Teal and patterned paper(from a Joann's stack). I colored the image in with my Copics. I am loving them!!! They are seriously one of my best crafting purchases ever! 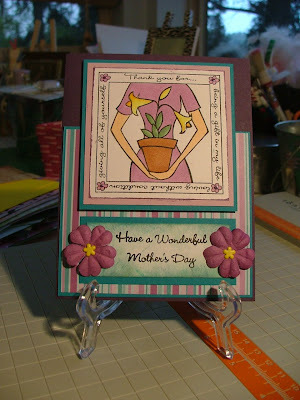 I added the purple primas to each side of the sentiment and inserted a yellow flower brad in the center of each. I think it pulls together the yellow in the flowers. Hope you have a fantastic Mother's Day! This is my first year celebrating as a mother and I'm enjoying my day! Hubby is wonderful and brought me flowers on Thursday! And this morning he made breakfast...banana pancakes! YUM! I know he got me something, but I don't know what it is yet. He took Bella shopping earlier and hasn't given it to me yet :) I'll have to let you know what it is! Great card, so come on share, what did they get you?!!!! Very pretty card. Great colors. All content (including text, photographs, and design work) is © Alana O'Reilly. My original artwork is for personal inspiration only and may not be copied for publication or contest submission. Happy Easter to All – He Has Risen! New Stamps! and a NEW design team!